As 2011 draws to a close I have reason to be thinking about things automotive. As part of my musings, I was reminded of the famous mantra espoused by the late Colin Chapman of Lotus Cars – ‘Simplify, then add lightness’. I have always liked this aphorism for its idea of ‘adding lightness’ rather than ‘subtracting weight’. So what’s this got to do with embedded systems you ask? Well, when it comes to embedded systems programming, I think Chapman’s concept is spot on. While most people would probably agree that simplifying an embedded system is a good thing, I wonder though how many actively work so as to achieve this? In my case I regularly hold conversations with my clients which can be summarized as: Yes I can do that, but it comes at the expense of complexity – and complexity leads to bugs – and bugs are very expensive. I have found that clients are quite appreciative of this as it forces them to evaluate what is truly important about the product. Incidentally, when I first started in the consulting business, I thought that it was my job to give the client whatever it was they asked for. The fact that in doing so I was often giving them a serious disservice was quite a revelation when the penny finally dropped. So what about the ‘adding lightness’ directive? Well clearly this is an interesting concept when it comes to firmware. I take it to mean that the code should be simple, easy to read, and fast in execution – in other words not unlike a Lotus sports car. If I have cause to re-read the code many months or years later and I find that the code has stood the test of time and is a pleasure to read, then I think I have achieved the required lightness. If by contrast the code is out of date and ugly to read then I know I have failed. In short it’s the difference between designing a Lotus Elan and an AMC Pacer. For obvious reasons, I usually write about things that are widely applicable. Today I’m going to deviate from this slightly and talk about the real time clock registers / RAM that are available on some (many?) ARM processors as well as I suspect a number of other architectures. An excerpt from the NXP data sheet is shown in the figure below. Of most interest is the column labeled ‘Reset Value’. You will notice that the values highlighted in red are ‘NC’. 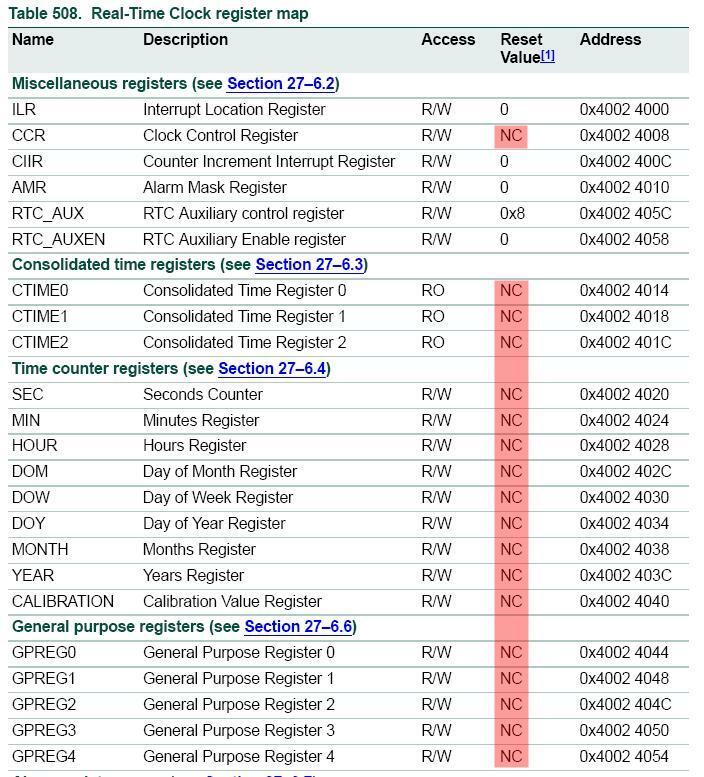 ‘NC’ means that the registers are unaffected by a reset condition. Furthermore, these particular registers may also be powered from an alternate power source such that they are also unaffected by loss of power. So why is this useful? Well I have found a couple of uses for them beyond the obvious and intended applications of maintaining date and time (for the RTC registers) and for providing non-volatile R/W storage for the General Purpose registers. Most embedded applications today contain a bootstrap loader (BSL). Although there are several ways of entering the BSL from the main application, the most common that I see is to force a watchdog reset, resulting in the CPU rebooting and starting up in the BSL. This technique is pretty good and I use it all the time. However I usually find it necessary for the main application to communicate some information to the BSL. For example, at a minimum the BSL needs to know that it has been intentionally entered for the purposes of performing a firmware update (as opposed to being entered as a result of a genuine watchdog failure). Under some circumstances I also need to pass other information to the BSL such as the port that initiated the update. In the past I have tended to pass this information via EEPROM. However with these registers available to me, I now use them for this task. If you are plagued with your system taking unexpected resets, then it’s a relatively trivial matter to write some debug code that writes context information to these registers. For example most RTOS provide mechanisms for calling user functions prior to performing a task switch. Within this function it’s trivial to write the task ID to one of these registers. Then it’s just a matter of putting a breakpoint on the entry into main() to discover which task was running when the reset occurred. Once you have it narrowed down to a task, you can then instrument functions in a similar manner. I suspect I may find other uses for these registers in the future. Suffice to say I’d really like it if this feature became widespread across all processor families.